On this day in 1922, Eleuterio Corral and Rumaldo Losano were hanged in New Mexico’s Grant County Jail in Silver City for the 1921 murder of a prison guard. Corral (left) and Losano (right). Losano and Corral were serving time in the Grant County Jail for robbery (Corral) and attempted larceny (Losano) in the spring of 1921. Losano had only fifteen days days left to go on his sentence. 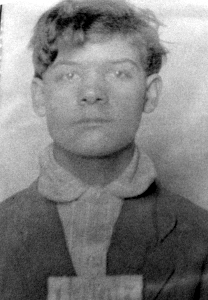 Nevertheless, on April 2, 1921, the two young men decided to make a break for it. The jailer, sixty-year-old Ventura Bencoma, had been sick with the flu and during the early morning hours he decided to have a lie-down. While Bencoma slept, Corral and Losano were able to get out of the cell they shared. A nearby cell was unoccupied and used for storing coal and firewood, and had an ax. The two convicts sneaked up on Bencoma and brained him with the ax, took his gun and keys, and threatened to shoot the other prisoners if they made any noise. They tried to use the keys to release another prisoner, Jesus Rocha, but weren’t able to get the lock undone and gave up. As soon as the pair had run off into the darkness, the others started screaming for help and woke up the sheriff, who was also enjoying a siesta of his own up on the second floor and had missed the entire jailbreak. 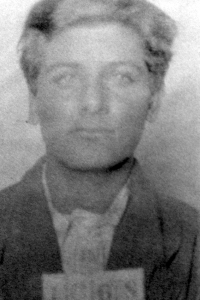 Both Eleuterio and Rumaldo bragged out loud of their escape and short freedom. Both men told Sheriff Casey it was Jesus Rocha who planned the escape and was to have joined them. Sheriff Casey learned from the two that after Jailer Bencoma’s keys and pistol were removed, they were to unlock the steel cell door to Jesus Rocha. Once he was released, the three were to go up to the second floor where Sheriff Casey’s quarters were and call him to the door. Once the Sheriff opened the door, he would be shot and killed with the jail’s pistol. The three would then arm themselves with the Sheriff’s rifles and ammunition. They planned to saddle the horses in the Sheriff’s corral and flee to Mexico. The plan began to fall apart after both failed to unlock the cell door to Jesus Rocha. In light of this information, Jesus Rocha was charged with murder alongside his criminal colleagues. At trial, Losano and Corral recanted their statements about his involvement and claimed Rocha had not been a part of the escape plan. All three were convicted and sentenced to hang, but the Supreme Court of New Mexico subsequently reversed Rocha’s conviction, leaving Corral and Losano to face the noose without him. Their families in Mexico pleaded for mercy, claiming that at the time of the murders, Corral was just sixteen years old and Losano seventeen. However, three physicians who examined them judged Corral was least nineteen and Losano was probably older than twenty. Officials set up the scaffold only about fifty feet from where Bencoma was murdered. Corral went first, then Losano. Both of them were calm and offered the standard prayers, apologies for their crimes and pleas for forgiveness.